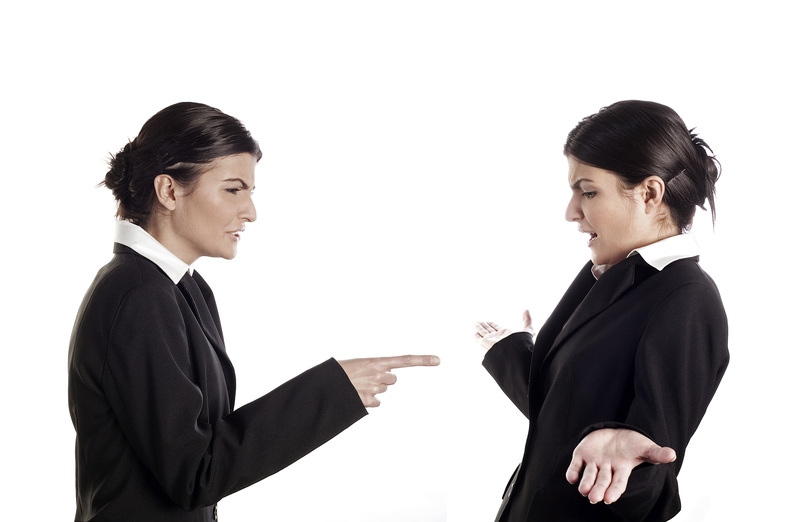 Who Should I Sue When Something Goes Wrong With A Real Estate Transaction? When buying or selling a home a real estate agent is one of the more often seen person helping either the buyer or seller out and therefore more likely to be considered the target for a lawsuit. Those who are thinking of suing their real estate agent or the agent for the other side first need to look at if the agent actually did anything wrong. Real estate agents are bound by a code of ethics that they are required to operate by when dealing with clients and customers. There is a difference too in the duties an agent owes to their client versus the duties they own to a customer or to the other party in a transaction. For instance an agent who represents a buyer should not be sharing with the seller personal financial information that could indicate how much home they could afford. If an agent who represents the buyer were to share that information with a seller and that caused the seller to ask for more money for the sale of their home than they normally would have expected the home buyer may have a case for suing their agent. Actually proving that in court is another story as it involves a lot of facts and circumstances that may not be that easily proved in a court of law. Prior to filing a lawsuit it may be worthwhile to speak with the real estate agents broker as ultimately the broker will be on the hook for actions committed by an agent who works for them. If the broker clearly sees the wrongs that may have been committed by their agent they may want to settle the matter before a lawsuit is filed. On the other hand if the broker is not interested in discussing the matter the next step should be to talk with an attorney. Should I Sue The Buyer or Seller? 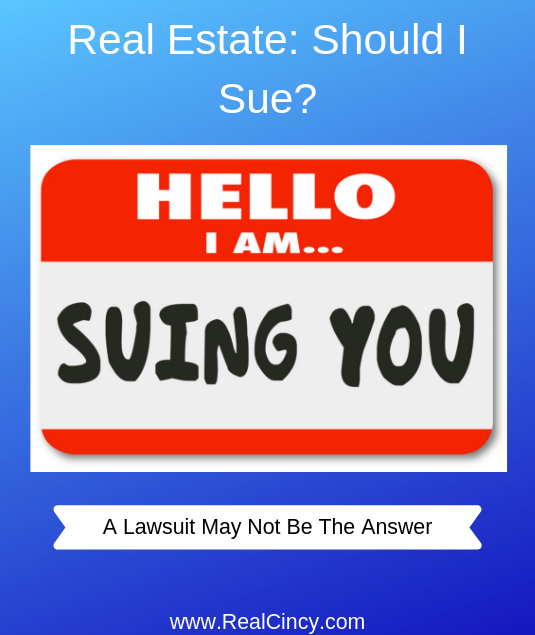 More often than not home or investment real estate buyers have a reason to sue the seller. Maybe the seller failed to disclose a material defect with the property that they knew about and the inspections missed. Those defects could be related to physical condition, lack of permits for work done, zoning changes, prior ownership claims or something else that could have an impact on the value of a particular piece of property. If a buyer were to sue the seller and win in some cases the seller has been forced to buy back the home or to pay the buyer damages for the loss in value and for making repairs for the undisclosed issues. Sellers on the other hand can sue buyers for failure to buy their home if the buyer walks away from the purchase after both parties have accepted the offer. If either the seller or the buyer walk away from the contract to purchase a home without relying on any of the contract contingencies a lawsuit may be needed to determine who gets any earnest money that was paid as part of the purchase. In most states the earnest money can only be released when the buyer, seller and both real estate brokers sign off on a contract release agreement. Should I Sue My Home Inspector? After the house has been purchased certain issues pop up that make you wonder whether the home inspector did a thorough enough job of inspecting the house. Whether you have roof leaks, plumbing issues, or something else often times the home inspector is looked at for not identifying and reporting a problem. Home inspectors usually have great general knowledge about the operation of a house. They are not specialists and often times the inspection reports they provide will state that fact and that professional licensed contractors should be consulted if the home buyer feels there is an issue with the house. Home inspection reports themselves provide an overview of various areas of the home and if the home inspector feels there is a bigger issue than meets the eye they will recommend that a professional contractor who deals with that area examine the issue. While home inspectors may be great generalists that does not mean they can catch everything especially if the seller makes attempts to hide issues with their home. In order to win in a lawsuit against a home inspector the new homeowner will have to prove the home inspector was grossly negligent in a lawsuit as usually home inspectors have their clients sign pretty strong waivers. If the seller was involved in hiding defects in a home then suing the home inspector may not be the best option. If there are major defects in a house that were missed by the inspector and possibly concealed by the seller further legal guidance should be sought. 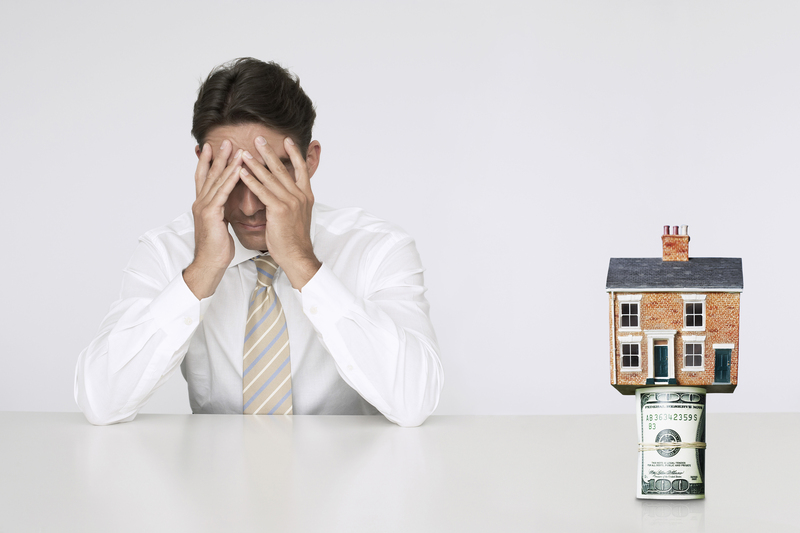 Should I Sue My Lender? When it comes to lending money with traditional mortgages there are many licensing and other regulatory requirements to ensure mortgage lenders operate as above board as possible. That does not mean there will be no licensed lenders out there who engage in behavior that may not be considered ethical by others, but is it lawsuit worthy? For instance a lender can add in extra fees to a loan that only benefits their bottom line, or the lender charged a slight higher interest rate so they could increase their commission on the loan. While those mentioned scenarios are possible the chances of successfully suing because of something like that is difficult. The borrower would need to prove that the actions by the lender were illegal (whether discriminatory or against laws and regulations) and the damages suffered need to be high enough to justify the expense of a lawsuit. In all of the discussion above about suing certain parties to a real estate transaction the one thing not looked at in depth is whether or not it makes sense to sue. It costs money to hire attorneys and file law suits. If the damage one suffers is small it may be a better choice to file in small claims court if that is an option as an attorney would not be needed there. Another possible better alternative to filing a lawsuit is filing a claim with the agent’s, inspector’s, lender’s insurance company as that may end up providing some amount of recovery without the huge expense associated with an actual lawsuit. Real estate agents, home inspectors, and other parties to the real estate transaction often are required to have insurance to protect them in the event of some unintentional mistake. Sometimes your local state agency may also have a source of funds that can be used to recover money due to the negligent actions of the real estate agent, inspector, appraiser or other real estate professionals. So be sure to check with state agency responsible for issuing licenses and regulating those professionals. Whenever considering the possibility of a lawsuit it is always best to speak with a local attorney who is an expert in that area of the law. Lawsuits can be expensive and time consuming actions that depending on how much damage was suffered may or may not make financial sense. Sometimes better avenues of damage recovery involve filing complaints with state regulators, ethics boards or small claims court. What To Do When The Buyer Decides Not To Buy - If the buyer walks away from a deal it is not the end of the world as this article explores. Thirteen Considerations Prior To Buying A Vacation Investment Property - When buying any kind of investment it is always wise to do plenty of research, this article provides important information for those wanting to invest in vacation rentals. About the author: The above article “Real Estate: Should I Sue?” was provided by Luxury Real Estate Specialist Paul Sian. Paul can be reached at paul@CinciNKYRealEstate.com or by phone at 513-560-8002. If you’re thinking of selling or buying your investment or commercial business property I would love to share my marketing knowledge and expertise to help you. Contact me today!